Earth Day is my favorite holiday. 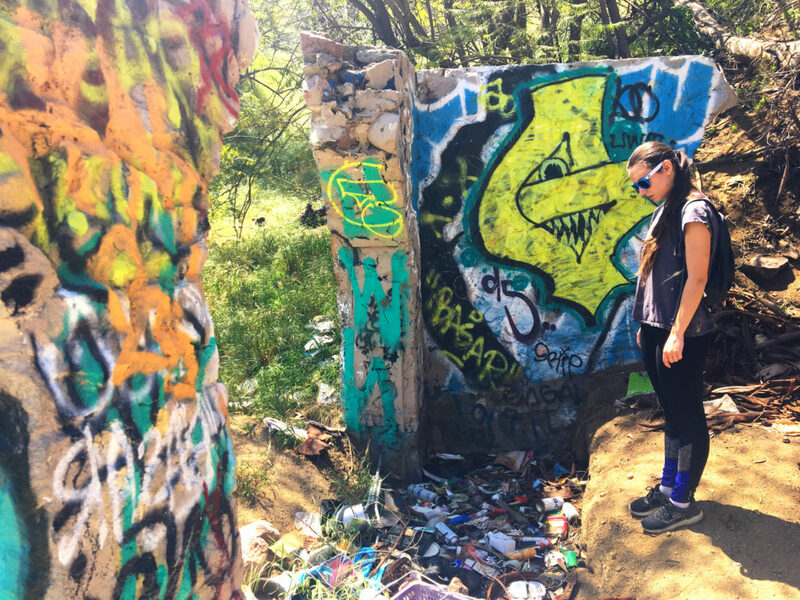 It’s on April 22nd every year, and was started in 1970 by Wisconsin senator Gaylord Nelson after seeing the terrible oil fires in Santa Barbara, CA the year before and deciding to channel the youth movement into a positive environmental impact. President Nixon presided over the first Earth Day and later created the Environmental Protection Agency, which led to the Clean Air Act, the Clean Water Act, the Endangered Species Act, and so much more. 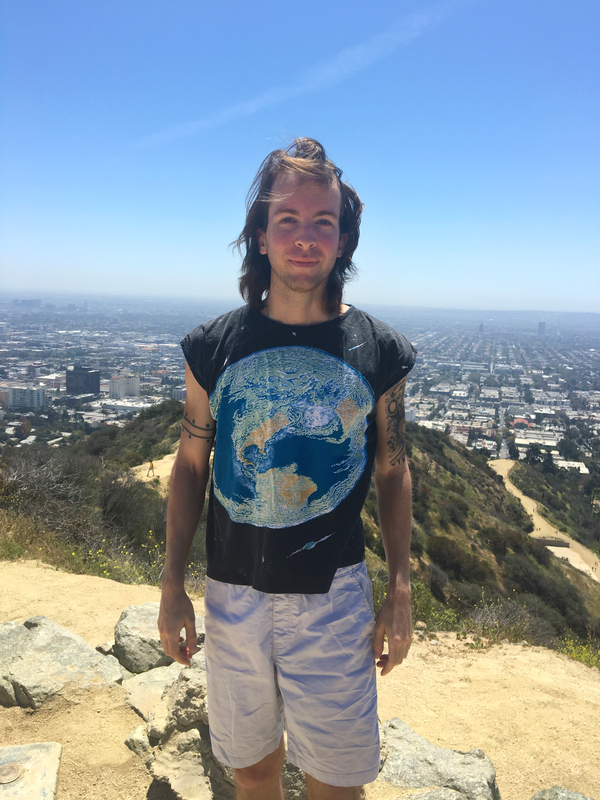 This year I celebrated Earth Day with Alex by hiking up the main trails of Runyon Canyon Park. Don’t just scroll past that panorama – click on it and let it load. (It might take a few seconds, it’s about 40MB.) It’s an amazing high-resolution view of Los Angeles. 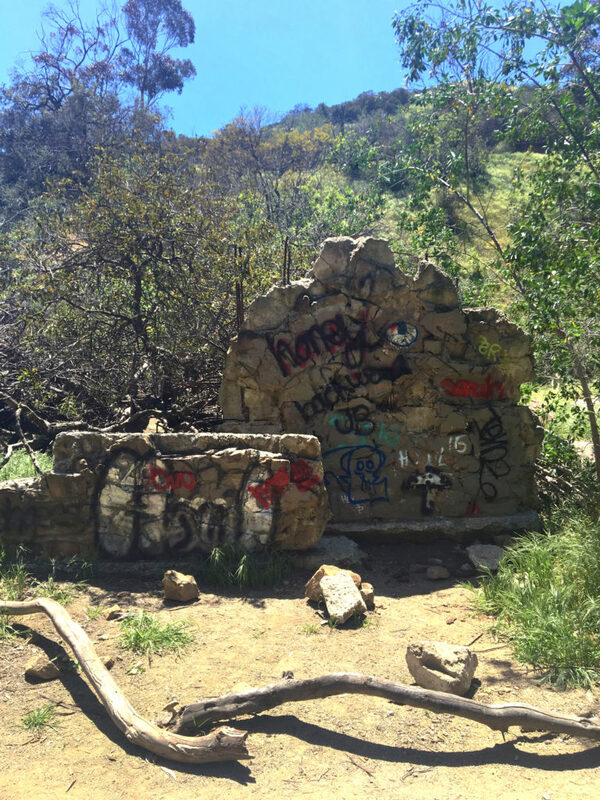 Runyon Canyon Park is 160 acres of the Santa Monica Mountains, the same mountain range that King Gillette Ranch is on. The easy trail is actually a fire road, which is a break in vegetation meant to stop or slow wildfires. 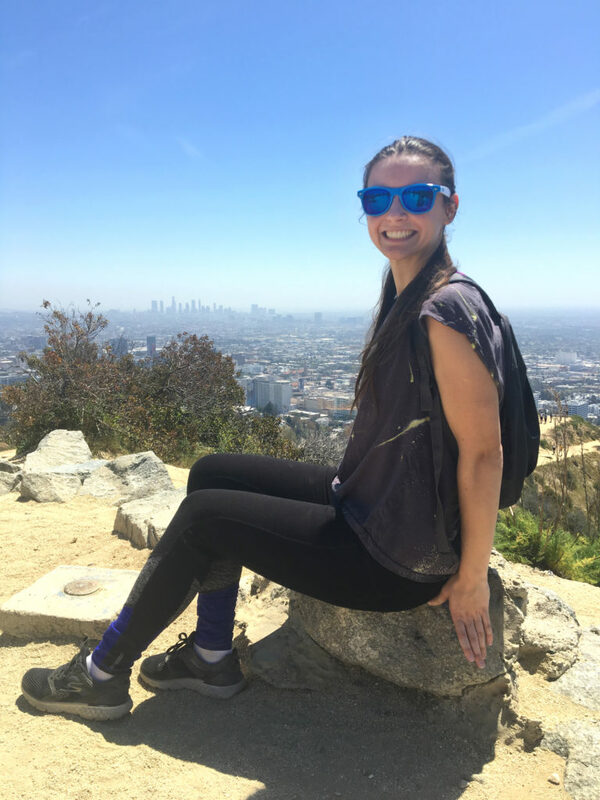 Runyon is a popular place for dogs, celebrities, and Instagram celebrities (aka not celebrities). Sometimes I think it’s a little basic because it’s right there in the middle of the city and I’ve done it quite a few times, but it’s still really fun. 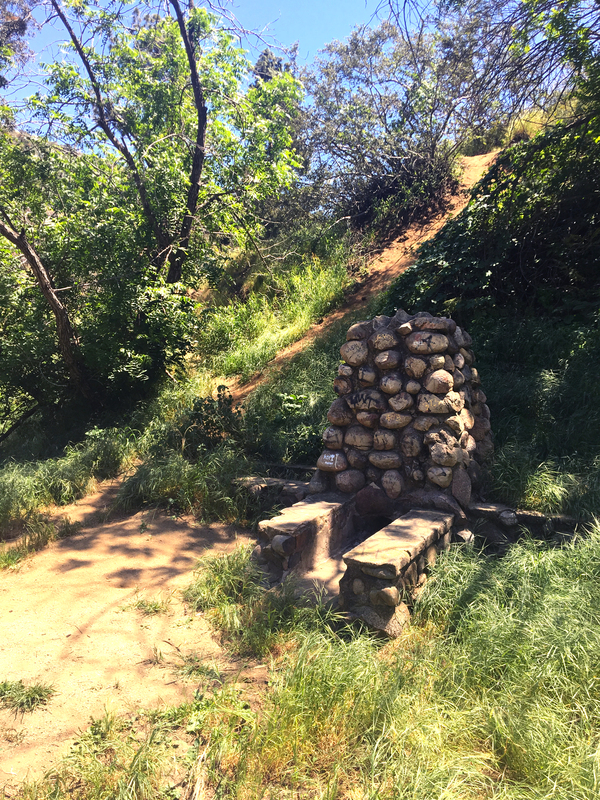 Runyon used to be called “No Man’s Canyon” before it was a park, and was a campground for Native Americans. It got its current name from Carman Runyon, a coal businessman who owned it in 1919. He sold it to a famous singer, John McCormack, in 1930. McCormack had filmed one of the first “talkie” films here, and later built a mansion, the remains of which can still be seen today. 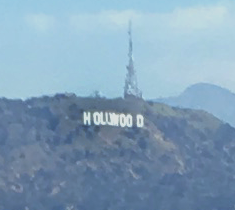 It was a popular celebrity spot in the 1930s. In 1964, one of the next owners, Huntington Hartford, decided to give the property to the City of Los Angeles. The City was controlled by corrupt businesses at the time, however, and turned the offer down. Hartford instead lowballed the property to Jules Berman, a wealthy importer of coffee liqueur. Berman destroyed all the buildings to avoid paying taxes on them, and planned to build a huge subdivision of luxury homes. Neighbors halted this initiative and the property sat in decay for a long time. Finally, in 2007, the City bought the land. 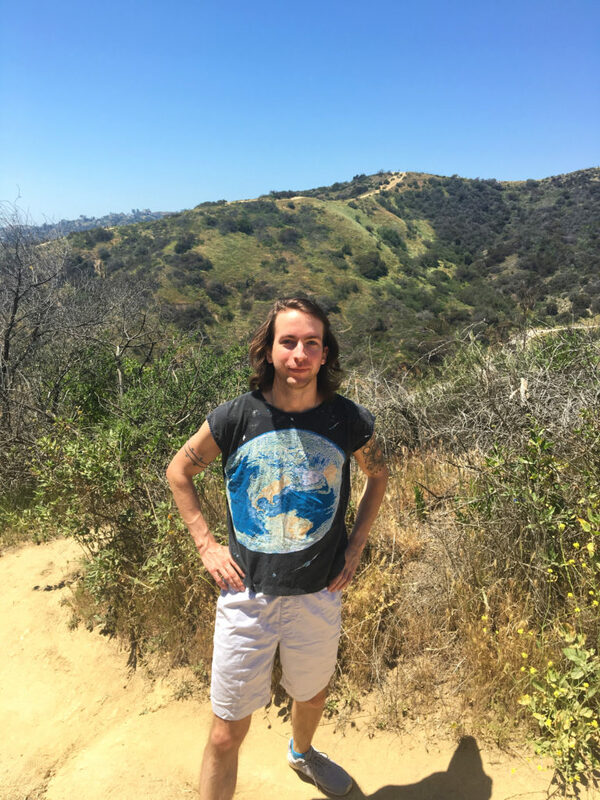 I’ve been up Runyon Canyon a few times, but I’ve only ever taken the easy trail, Runyon Canyon Road. To be honest, I’ve just never really paid attention to the other two. So when Alex suggested we do the other two, the Star Trail and the Hero Trail, I was game. Yes, we did coordinate our shirts. Both of them are mine, actually, and used to belong to my dad. The one I let Alex wear is shooting stars and galaxies and has more of a brown/purple tint, while mine is a little more bluish and in front of the stars features THE EARTH. It’s the only shirt I’ll wear on Earth Day. The trails that Alex showed me were definitely more fun than the easy old Runyon Canyon Road. There were actual ascents, climbs, switchbacks, and portions where you had to use your hands to crawl up or scooch down. Felt great! 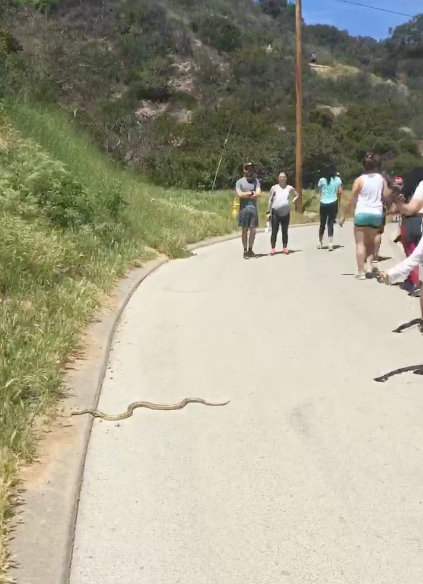 Around us were a mix of people who were also enjoying it, and people who, I think, didn’t expect Runyon to be that tough. Hey, at least it’s a workout. We walked around beneath some power lines and in front of various mansions and homes on the hills above. There’s a long staircase detour because one of the mansion owners blocked off a portion of the trail. The stairs were probably the most boring part. And then came one of the most exciting parts! We noticed that a snake was about to cross the road, very close to where we were walking already. 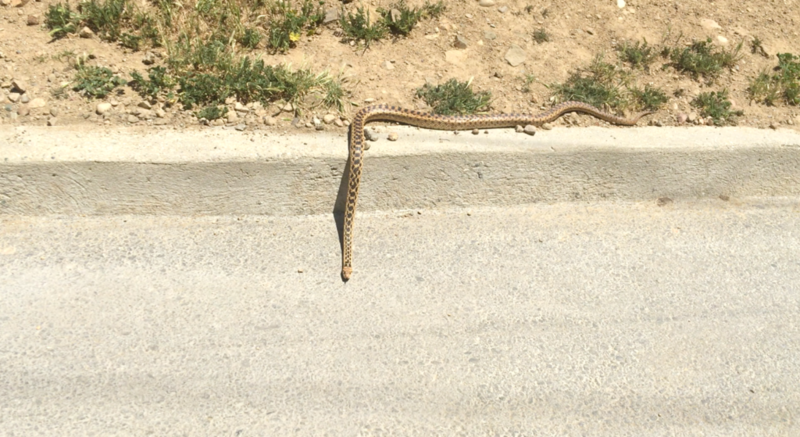 It was a California glossy snake that happened to be coming right at me. I got out of its way after a couple photos, of course. 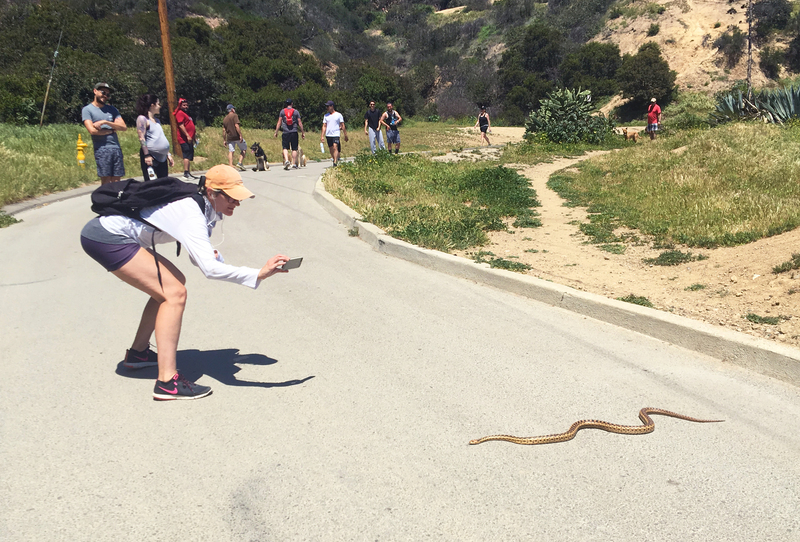 They’re nonvenomous, but of course you never take chances and we weren’t sure what it was at the time anyway. It got a little crowd while it crossed. Everyone was very respectful and let it pass peacefully. Good time to restrain your dogs. The little guy just wanted to come out and celebrate Earth Day too. We climbed down the railroad tie route and were back at the entrance in no time. 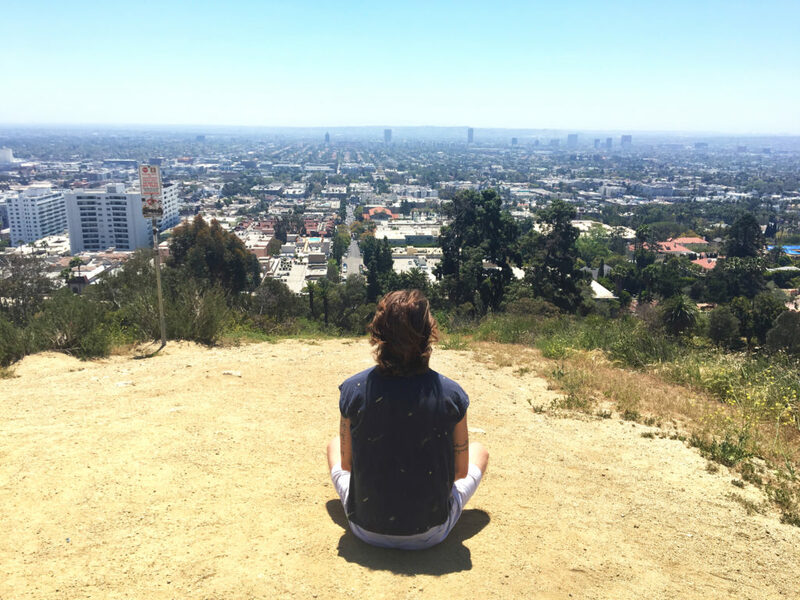 Now it was my turn to show Alex some new parts of Runyon that she’d never seen before. 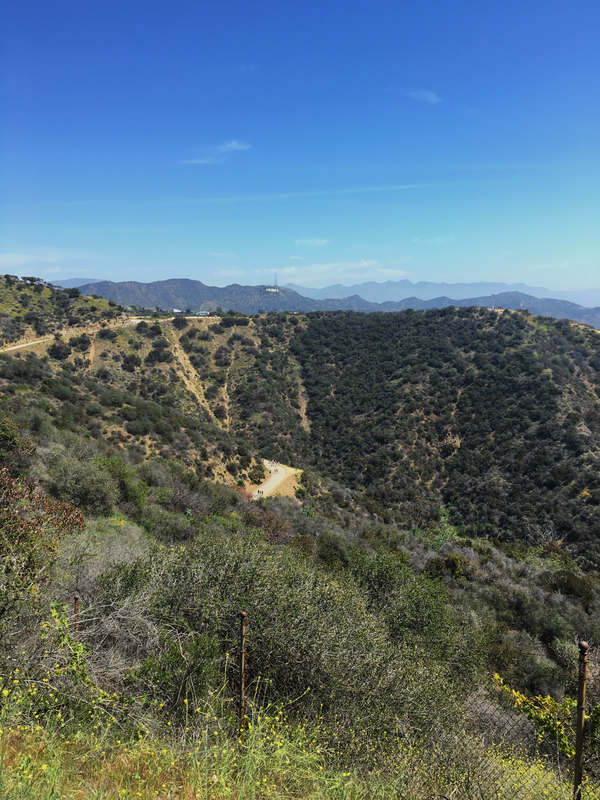 If you hike into the middle lower section of Runyon, there’s a bit that appears to switchback sharply up to the right. But if you ignore that and just keep going forward, trekking over a short section of grass, you emerge onto another, much less known trail. There’s rarely, if ever, anyone else in this part, and a lot of it is overgrown. To be honest, the first time I stumbled on it I wasn’t sure if it was a real trail or not, and I guess I’m still not sure, but there’s plenty of reason to go anyway. First is this ruined wall. I’m sure this was something once upon a time, but I have no idea what. Now it just serves as canvas. Yes, that is a drawing of the Grim Reaper from Billy & Mandy down there in blue. 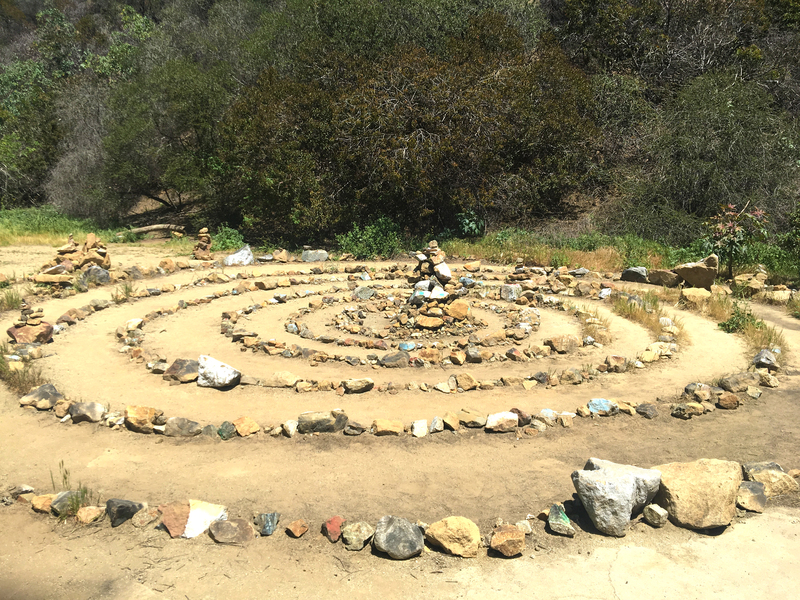 Next up is the giant stone spiral. I have no idea how this was started or how it’s maintained, but someone must do it. I’m pretty sure this didn’t happen naturally. There was a family here too, which was the first time I’ve ever seen another person back here. They were sitting off to the side and Alex was pretty sure that one of them was a celebrity of some sort because they kept trying to keep a low profile, but not in a suspicious way. We walked the trail here laid out by the stones until we got to the center. 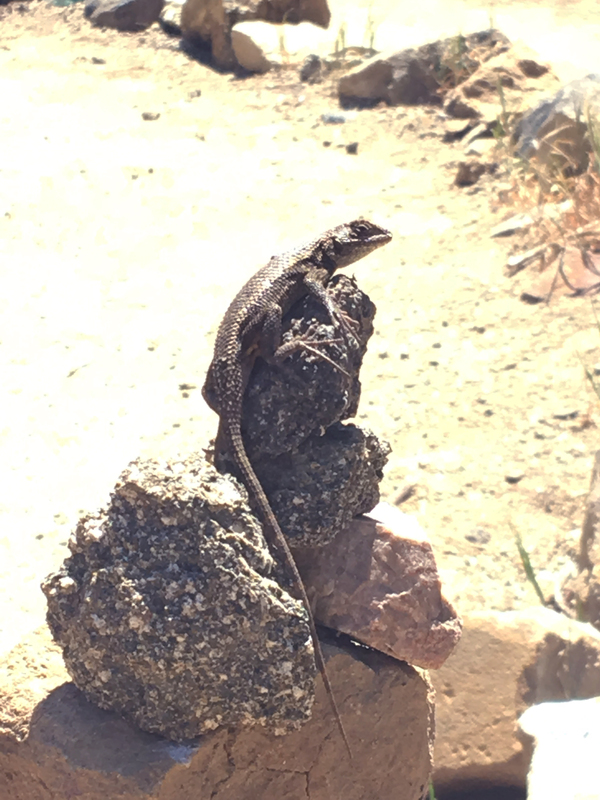 We also saw a western fence lizard hangin’ out on a rock. Fun fact: western fence lizards have antibodies in their blood that destroy lyme disease. So when ticks feed on them (which they commonly do), the lizard blood eliminates the lyme disease in those ticks. However it also turns out that the ticks mostly feed on these lizards, so if you remove the lizards, the ticks also mostly go away. So is it better to have the lizards or not? This thing always looks so magical to me. The stonework, the way it’s set beneath the hill… I love it. That trail there goes pretty much nowhere, by the way, it’s not worth the climb – you just come right back down on the other side. Then past there is the abandoned structure. Who knows what this place was? Clearly it’s been used by homeless folk for quite a while; there’s tons of gross trash on the “floor” and I wouldn’t want to chance coming here after dark. It’s always silent around here since the hiking trails all around us are far enough away and raised out of the valley. 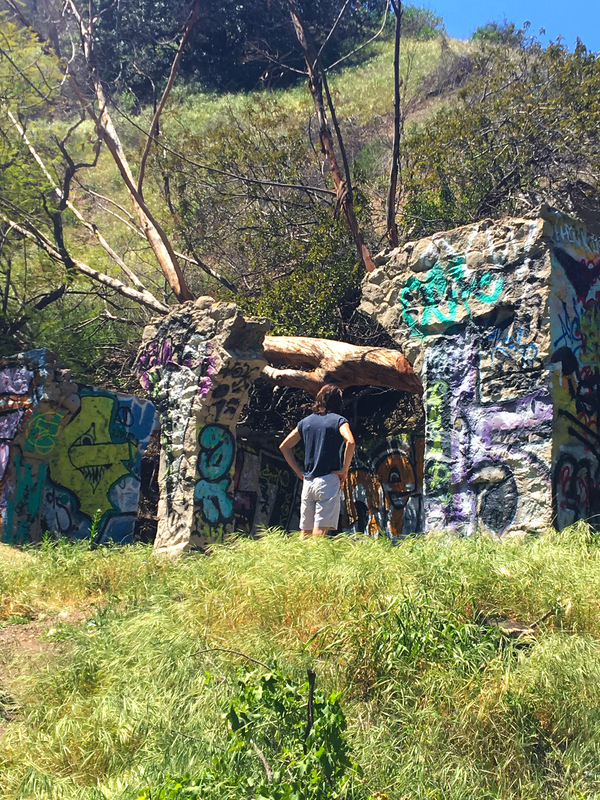 Alex had been hiking around Runyon for years and years of living here but had never seen this before. 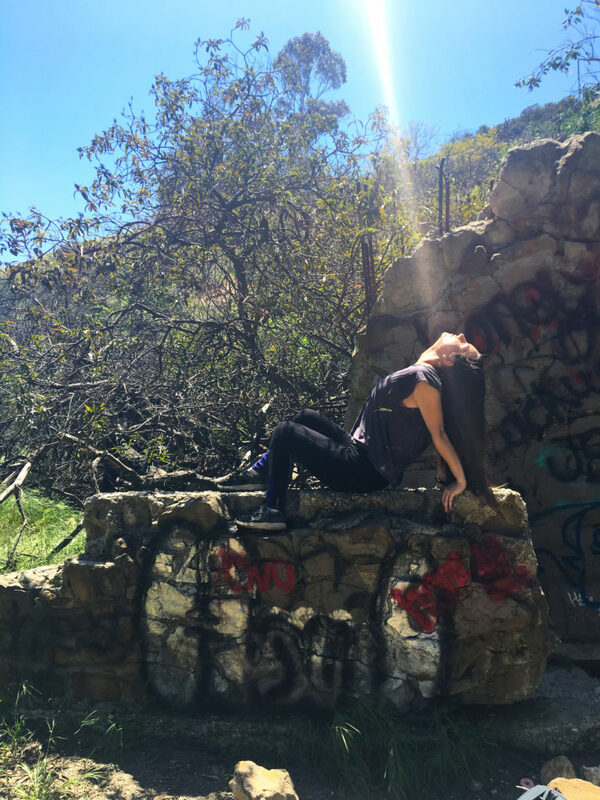 I suspect most Runyon hikers haven’t either. 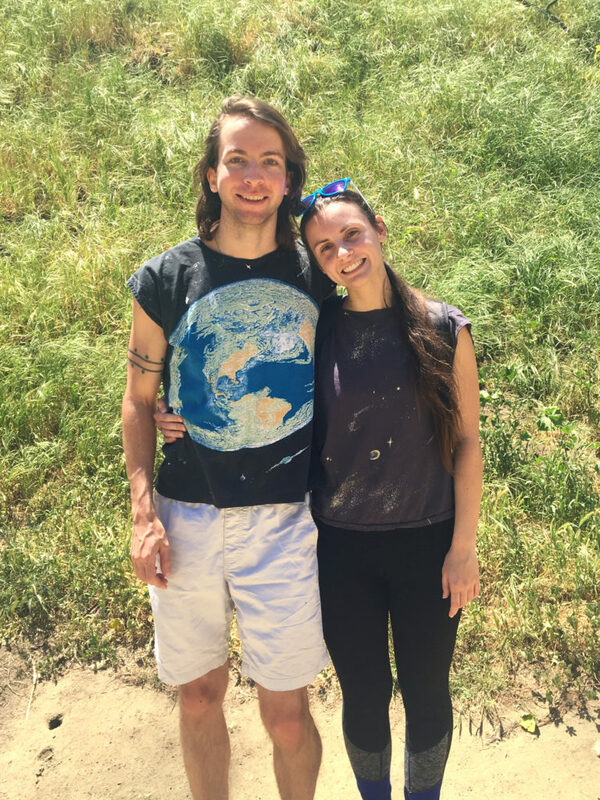 After thoroughly completing Runyon Canyon Park, Alex and I stumbled out onto the main area again and got this nice friendly photo taken by a passer by. 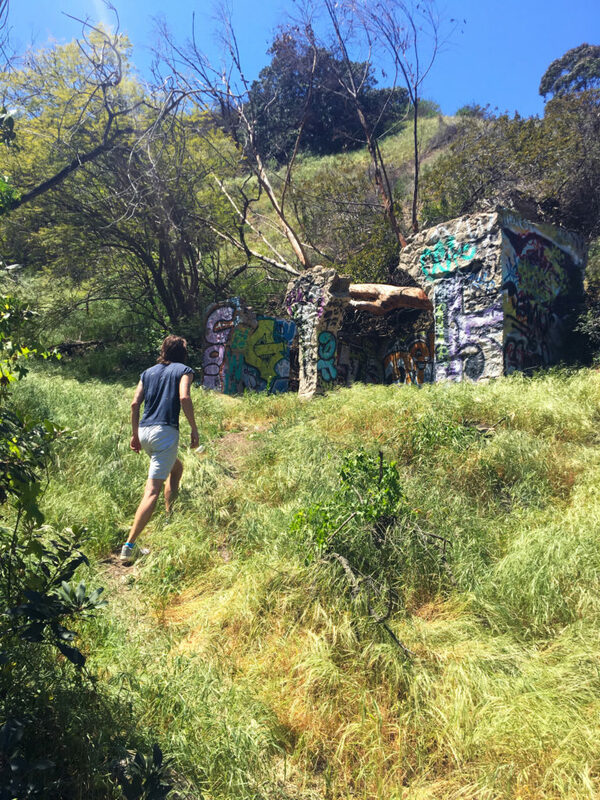 When you go to Runyon Canyon Park, make sure you explore a little – it’s not as basic as you might think!